[Episcopal News Service – Austin, Texas] Throughout the 79th General Convention, Sandra Montes has been one of the leading voices witnessing on behalf of immigrants. She speaks from firsthand experience. In addition to her powerful testimony at legislative sessions, she’s also impressed the convention with her beautiful singing. A native of Peru, Montes spent her childhood in Guatemala before her parents moved with her to the United States where her father served as an evangelical pastor. After a stop in the Rio Grande Valley of Texas, they eventually settled in Houston in the 1980s. General Convention is considering several resolutions that provide broad, forceful statements on the issues of separation of families in immigrant detention, the sanctuary church movement and the dignity of immigrants in the face of federal policies that deputies and bishops say go against the Episcopal Church’s Christian values. On July 8, Montes was among 1,000 Episcopalians to gather at the T. Don Hutto detention facility in Taylor, Texas, to speak against the actions of the U.S. government in its enforcement of immigration policies that have separated families over the last few months. “Today is my son’s birthday, and if he had ever been taken from me, I don’t know what I would have done … just because I was trying to bring him somewhere where he could have liberty, where he could have a life,” she said at the rally. After they arrived in Houston, Montes’ father was eventually ordained as an Episcopal priest and served as rector of Iglesia Episcopal San Mateo, one of the largest all-Latino churches in the Episcopal Church. Though now retired, he helps at a Lutheran Church in Houston. Her brother, the Rev. Alex Montes-Vela, is chair of the Texas deputies and serves as a priest at St. Mary Magdalene Episcopal Church in Manor, Texas, which began with five people meeting in his home in 2010. Her niece, Luz Montes, is also a Texas deputy and attends the Seminary of the Southwest in Austin with plans to be ordained as an Episcopal priest. Her father believed that “God had called our whole family to ministry,” she said. Montes spent a career as a public school teacher before retiring. She now assists the Episcopal Church Foundation as a Spanish-language resource consultant, a position in which she assists the foundation in developing practical resources on issues addressing the leadership and financial challenges facing Spanish-speaking Episcopal congregations, develops and leads presentations for online and other educational events and collaborates with foundation staff to develop greater capacity in this area. She has been approached during the convention by those seeking her assistance in developing bilingual resources for their own dioceses and churches. 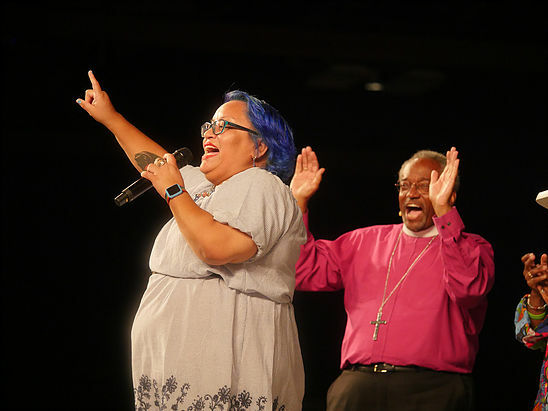 In addition to being an advocate for immigrants, Montes fired up the audience with a powerful performance prior to Presiding Bishop Michael Curry’s sermon at the July 7 revival. She also sang during the rally held outside the Hutto detention facility in Taylor. Never professionally trained in voice or music, she enjoys singing and writing her own songs. “My mom says I was born singing,” she said. At home, Montes said she does not attend a specific church. As a Latina wearing purple hair, she admits that she stands out – but is on a mission to learn how welcoming a congregation is when she walks through the door. Based on her experiences, she offers a few pointers on making visitors feel welcome, such as having parking spaces reserved for visitors, smiles and cleanliness. “One of the biggest things that I really appreciate is that if they ask me to stay for coffee and either take me and stay with me or give me to somebody else,” she said. She said she’s had mixed emotions while attending General Convention, starting with the opening Eucharist. “On stage were white women dressed in African clothing playing drums,” she said, explaining that this was an unfortunate cultural appropriation. Whites, she said, don’t realize the impression this may leave with African-Americans, Native Americans, Latinos or Asians. “I don’t know what message that’s giving, but I know what I thought,” she said. Also missing at the convention has been a diversity of music and performers. “The music has been great, but it has not been diverse. We are still very white,” she said. So evil for the church to be “white”. That’s why I’m leaving it.